Go to any festival or fair, and you will see children with beautiful face paint designs. When my daughter was younger, I would worry about what these face paints were actually made from and if they were safe. She had her face painted so rarely, that I didn’t make a big deal about it, but I was still quite hesitant. I knew there had to be chemicals, like parabens in those vibrant colors. This was confirmed when I looked at Halloween face paint this year and wanted her to make her own. Perhaps even more alarming is the fact that The Campaign for Safe Cosmetics has found that 10 out of 10 kids’ Halloween makeup tested positive for lead. That doesn’t mean that every single makeup on the market contains lead but many, even perhaps most, will. As a mom, it’s not a gamble I want to take. According to the Campaign for Safe Cosmetics: At least a million children in the U.S. exceed the currently accepted threshold for blood lead level exposure that affects behavior and cognition. Lead is banned from makeup in both Canada and Europe but it’s allowed AT ANY LEVEL in makeup in the U.S.
Face paint isn’t just for Halloween. It’s a lovely way for a child to feel spring with flowers on their face or fairies…but what to do about toxic face paint? We were sent a party pack of [amazon_link id=”B00MCC46AE” target=”_blank” ]Go Green Face Paint[/amazon_link]. Finally, there is a safe face paint, made in the USA and lead-free! 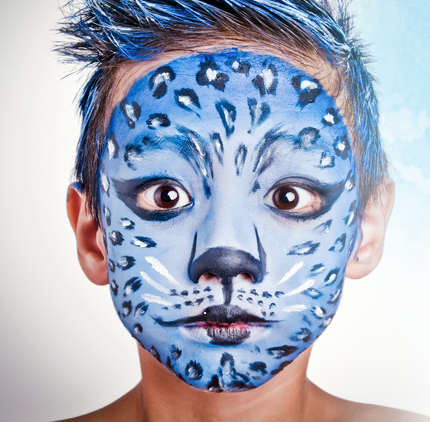 Looking for high-quality natural LEAD-FREE, DYE-FREE, PARABEN-FREE face paints? You found it! We know how much you care about keeping your family safe because, we are parents, too so, are our designers. We are proud to be pioneers in the organic industry. That’s why we’re committed to organic standards and ingredients. That means every choice we make-from the ingredients we use in our products to the products we put on the shelf are consistent with Certified Organic Guidelines. You’ll find our products contain 95% organic ingredients, which is beyond the minimum standards enforced by the FDA. We’re proud to be recommended by Martha Stewarts “Whole Living Magazine for products designed with children’s safety in mind. Go Green Face Paint is ready to apply with sponges, brushes or fingertips. These face paint will not dry out like normal water based face paint, require no added water, and have a shelf life of 36 months, allowing you to use them again and again. With ingredients like Jojoba oil, it is long lasting, while allowing the face to breathe and every color is safe for eyes, lips and face. We allow you to make your own choices. That is why we don’t limit you to one kit of 5 colors or claim to be a kit by giving you a cheap Q-tip brush. Go Green Face Paint offers you the choice of 15 vibrant colors and 6 different sets in interlocking stackable sets that are easy to customize and you will not open your package and find colors missing. Our products are free of harmful ingredients. They Do Not contain any micronized minerals/nano-particles – No coated minerals – No Parabens – No preservatives – No talc – No Bismuth (causes itching, redness or rashes) – No Synthetic dyes – No parabens – No carmine – No fragrances – No PetroChemicals – Non-comedogenic / Will not clog pores – Cruelty Free / No Animal Testing. Our face paints are popular all year round! We are proud to be able to display the Made in U.S.A. logo. These face paints are amazing! I love the variety of colors. My son is ready to open a booth and starting making money painting children’s faces at the next school fair! I wish I had these face paints when my children little. My little girl would have not been deprived, as she was, to only getting her cheeks adorned on a few occasions. I am so excited there is finally an organic, green face paint for children! No parabens, no lead! « What’s in your supplements? Petroleum, rocks, artificial dyes?